Thank you so much for joining us at the 5th Annual Run Holden Beach certified road race! As we get ready for Saturday 9/15, we’re covering a lot of the frequently asked questions regarding our packet pickup, parking and race day but if you have any questions at all, you can contact us and we’ll try to get right back to you! IMPORTANT! All runners must be over the bridge and on the island before 6:45 for all races! The bridge will be shut down to traffic from 6:45 – 7:30 so if you’re not on the island, you will miss the start of your race! *All parking is ON the island. Please know your bib #. It was in your pre-race email but if you need to look it up, you can click here. Look on the left side for “Lookup Registration” and bib numbers are going to be in the left column. THIS EVENT WILL VERY LIKELY BE SOLD OUT – KNOW SOMEONE THAT’S MISSING OUT? As of writing this, we have less than 100 spots left in each of the Half Marathon, 5K and 1 mile races. If you know someone that waits until the last minute to sign up, tell them to get online and register now. We will not be overselling our cap. DOUBLE BLING OPTION! 5K RUNNERS CAN RUN THE 1 MILE! We have a cute Narwhal medal that all 1 milers will receive. It starts at 8:30am so our 5K’ers have plenty of time to finish up and participate in the 1 Mile. We have limited space available so if you have family/friends that want to run/walk the 1 mile, get them registered now. Or if you’re in the 5K, go ahead and register for the 1 mile to double up on the bling! Carpooling is highly encouraged. You DEFINITELY want to come over the bridge and onto the island to park – click here for directions. The island of Holden Beach has very limited parking and we’ve done our best to secure as many lots as possible for you. We’ve spoken to the local authorities to be lenient on parking tickets. Please follow all directional volunteers in the morning to get you to parking lots and areas we have approved for parking. Sides of roads are allowed – we encourage perpendicular parking and please make sure your entire vehicle is off of the road. Please do not block any signs. Mermaids restaurant (which is 1 block from our start/finish line) is an excellent option and a supporter of the event. Stop in and give them a try – everything is delicious! Holiday Inn off of 211 toward Southport is only a 15 minute drive from the start/finish line and pretty much the closest hotel. They are providing a special rate just for runners but have limited availability! Be sure to mention you’re coming for the race to get the best rate around! They are also very accommodating to runners if you let them know you’re coming for the Run Holden Beach Event. To stay closer, there is the Grey Gull Motel on the causeway. “Do Drop Inn” is on the island and may have vacancy. You may also want to call a vacation rental like Brunswickland Realty or Alan Holden Vacations to see if they will do a short term rental (shorter than a week) as we get this close to race day. We will host a packet pickup on Friday September 14th from 2pm – 7pm at Sabbath Home Baptist Church located HERE (990 Sabbath Home Rd. Holden Beach, NC 28462). We are asking ALL packets to be picked up here on Friday night. If you can’t make it, it’s ok to pick up race day morning – but please come extra early! FAQ: Is it ok to have a friend pickup your packet? Yes, you may have a friend/family member pick up your packet. They must have your bib %BIB_NUMBER% and copy of your photo ID. This could be a picture or screenshot on their phone – or printed. FAQ: What goes on at Packet Pickup? You get your packet – bib, pins and tshirt. There are also several vendors setup for health, wellness and athletic performance so bring some cash/card to do some fun shopping. Also, Coastal Race will have some crazy special deals for future races! IMPORTANT – ALL RUNNERS! The Bridge will be shut down completely from 6:45am – 7:30am. If you don’t make it on the island before 7am – you WILL miss the start of your race! This includes the Half AND the 5K participants!! PARKING: There are several places to park around the start/finish line such as The Holden Beach Chapel, public parking and along the sides of the road. Be sure that your entire vehicle is off of the road. You will definitely want to park ON the island. Early birds get good parking spots. (1) Arrive 45-60 minutes earlier for parking and warm-up. (2) Bring your bib & pins! (3) Cash for extra food, drinks, swag – especially spectators. (5) Bring pre-race hydration! We’ve got your need’s covered after the race with bottle water, banana’s, jugs of Gatorade, pizza and beer. But be sure to bring any pre race hydration or nutrition you may need. CLICK HERE for directions to the start/finish line. – ICEE POP station toward the end! – 1 Water Stop with Gatorade and Water. – A Fun Walk/Run on the road – 100% of the money from this race go to the Turtle Patrol! 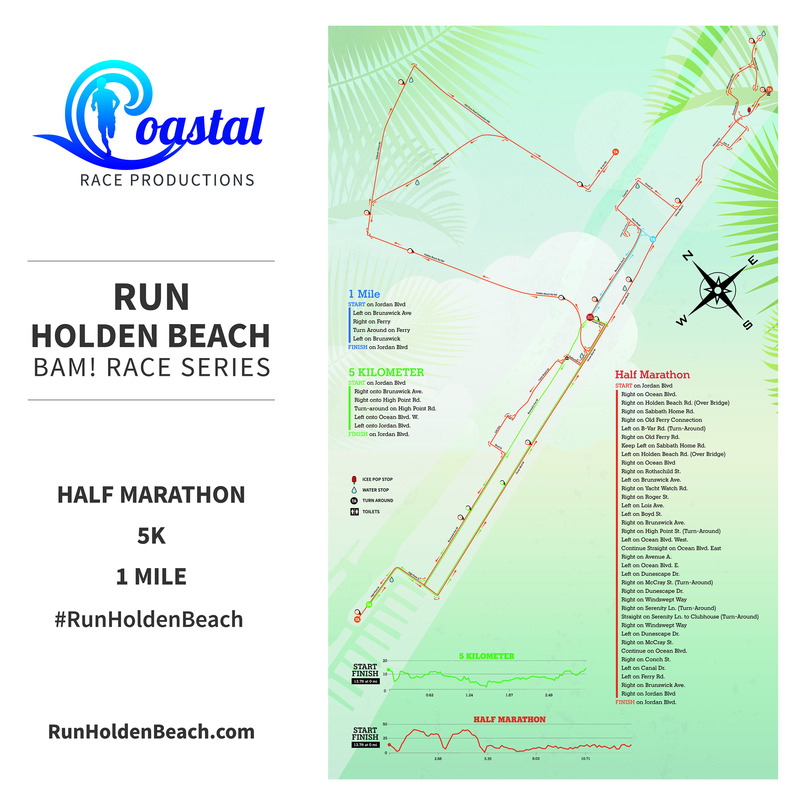 *If you go to the website: http://runholdenbeach.com you will see a large course map and a printable PDF for all of the routes. We will also have a large map for you to look at during packet pickup and by the start line on race day. 1) Pre-hydrate and use all of our waterstops! Pre-hydration for a half marathon should also take place in the days before the event! 2) When running where it hasn’t been coned off, please run against traffic and stay to the side of the road and be courteous of drivers and residents. 3) Follow your race arrows on ground, signs, overhead and volunteers on course. 4) Find a pace group at the beginning to place yourself in the corral by speed even if you don’t plan to run with the pace group. 5) Don’t let headphones and music keep you from hearing runners and what’s around you. Be a conscious and courteous runner. 6) If you need to walk, please pull over to the side first so runners right behind you can easily get around without stopping. We do this every race and it’s a fun way to share pictures and have a chance to run for free! Use #RunHoldenBeach to share with your friends you’re running in this race. Take pictures of your training runs, during the race and at the after party – post on Facebook, Twitter & Instagram. We’ll be sharing your pics on our website and facebook page. Be sure to tag us or post to our page so that we see your pictures! 1 Lucky winner from the photos uploaded will win a FREE entry into any of our races – your choice! You can start sharing pictures NOW! DON’T MISS THESE AMAZING BEACH RACES! #2) Calabash Turkey Trot (11/22) *All New 10K, 5K and Mashed Potato Miler. New routes, trophies, pumpkin pie, awards, awesome finisher medals, and so much more! 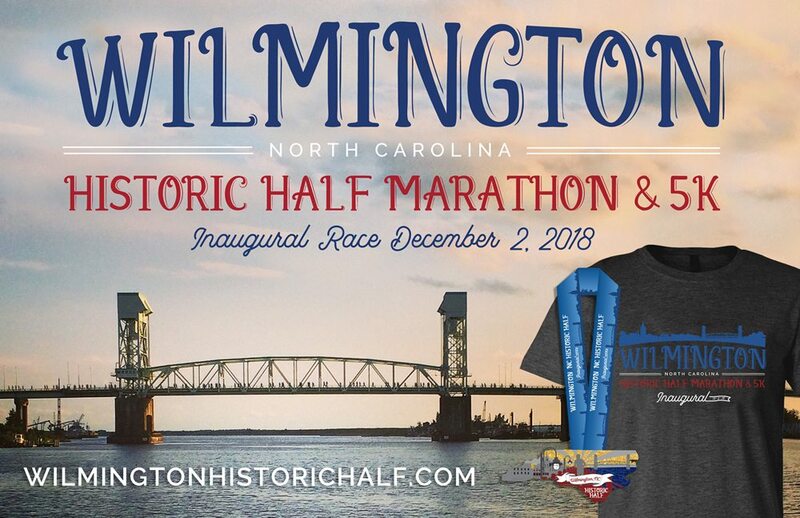 #3) Wilmington Historic Half Marathon & 5K – Long sleeve participant 1/4 Zips, Huge finisher medals, guest speaker Bart Yasso and so much more! Can I swap tshirt sizes? Yes, you can login to your Run Sign Up account and change this upto 7 days prior to race day. If you get to packet pickup, we will have a shirt swap station based on availability. When Are Awards? 1 Mile/5K awards will be around 9:00; Half Marathon awards will be around 9:45. What Awards Are Recognized? Top 3 overall M/F and 5 year age groups. Strollers Allowed? Strollers are allowed on all courses but must start in a separate corral. Please start toward the back and we will have a different start for you. Please be careful and watch your surroundings! Dogs Allowed? Sorry to say but due to USATF sanctioning, no dogs are allowed at the event. Will I receive a medal? All runners will receive a medal, we will not oversell. What’s the plan for inclement weather? This is a rain or shine event. If a hurricane causes cancellation, we will find a rain date or allow a “virtual” option where you can pick up your shirt/medal. If the event is cancelled due to a hurricane, we will be offering refunds to runners in 2018. See our General FAQ’s Page and our Run Holden Beach Race Page for more information and again, please don’t hesitate to email us here and we’ll do our best to respond promptly.